Cloud and cloud services have quickly become natural elements in our modern IT lexicon. The use of cloud services is steadily increasing and more and more organizations realize the benefits of moving infrastructure and applications to the cloud. It is understandable. The benefits of the cloud are endless, but in order to maximize the business value, you need to link the investment to your higher organizational goals. You need to know what you want to achieve and make decisions based on your goals - before you begin the journey. Only then can you see the real benefits of having a scalable, cost-effective and secure solution in the cloud. Only then can you speed up innovation, while maintaining control at the same time. How do you connect the cloud journey you’re about to embark on to your organizational goals in order to maximize the business value? Firstly, you need to be well prepared and plan the journey, by using models like for example Cloud Readiness Assessment. A Cloud Readiness Assessment is an analysis of your applications; your infrastructure and organization linked to your business needs. It is an assessment of the maturity needed to deal with and carry out all of the necessary activities required when moving to the cloud. It simply creates a plan for how to get to the cloud in a secure and cost-effective way - a critical factor when you choose to migrate to the cloud. 1. Clarifying your goals - What do you want to achieve from a technical as well as business perspective and when do you need to achieve this? 2. Define the benefits you wish to realize by going cloud. What do you want to achieve with your cloud services? Again, the benefits are endless, but what is the purpose of your transformation and how should you measure your success? 3. Determine any gaps between current and desired business mode. Where would you like to be in 2-5 years? Moreover, what is needed to get you there? In 2018, over 50% of the cloud initiatives are about moving more business to the cloud. Even more people see the challenge of optimizing the use of their existing cloud services as a major issue. This indicates that they have not made the journey smart from the start. By making well-founded decisions based on your strategic business goals, you can focus on optimizing your solution even before a migration to cloud. You should not move without asking questions like what, how and why. Otherwise, it can be unnecessarily expensive and you will not get the full value out of your solutions. In what state is your business today and how will it change in the short and long term? What kind of relationships do you have with your customers today? Do you allow customers to influence your products and services? Will your customer base be increasing a lot in existing markets? Or will you get into new markets soon, maybe in other countries? What is your product development plan? Are you agile enough and can adapt to change or is IT a bottleneck for your business needs? You do not have to get into all details. One of the advantages of cloud is scalability and the opportunity to grow with your outside world without having to tie up a lot of capital. Therefore, you do not need to define in advance what the customer base or product portfolio looks like in detail. It is more about making the big decisions that creates better prerequisites for making a good enough solution right from the start. The idea is to avoid bottlenecks and to focus right from start. This will result in optimal conditions for you to be agile and flexible in order to develop in line with your customers and business needs. The cloud is here to stay and in order to make the most of it you need to think about how to best use the benefits of cloud. The pace is high and new services are constantly evolving. It is hard to grasp and see the wholeness without first discovering and analyzing your own goals and purpose of moving to cloud. In addition, you need a thorough plan for your cloud journey, and once in the cloud – a plan for how to optimize the solution and keep track of the costs. Cloud Readiness Assessment is a model that creates this overall picture with proven good results for many organizations. A structured analysis with a thorough business case to get ready for the cloud. That is the key to being able to maximize the business value. With a Cloud Readiness Assessment, you get a well-founded basis for decisions that shows the profits of a shift to cloud compared to existing IT costs. You will also get an estimate of the costs of moving and a plan with details for the first 6-9 months. A thorough decision base creates good conditions for making the desired change smooth, smart and cost-effective. Therefore, my advice is to invest time into this work - it will pay off and create value for your organization in the long run! 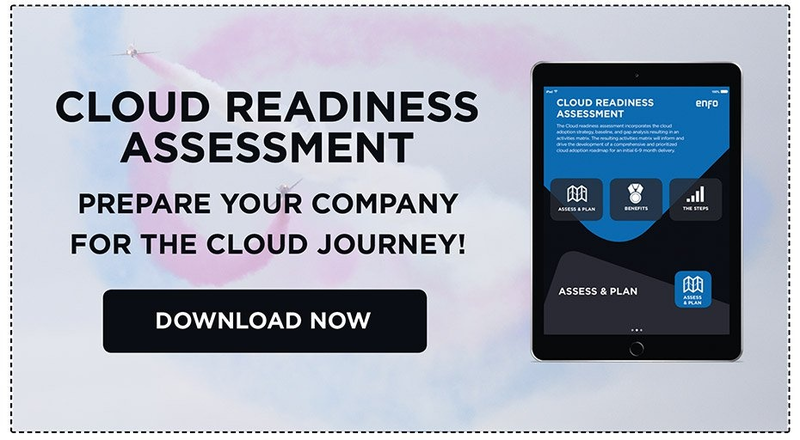 Want to know more about what's included in a Cloud Readiness Assessment and how to get a comprehensive decision base? Download our whitepaper today!